The above is not a statement about Eleanor’s mood, addressed to someone called Hardingstone (which I’m thinking is a good name for a butler); it’s a memorial to a dead queen beside a busy road in a suburb of Northampton. And it is part of an old love story. When you think of King Edward I of England (as I’m sure you often do), picture an educated, able, tough, testosterone-charged man; a legislator, reformer, summoner of parliaments, builder of castles, warrior and crusader. Not renowned for his peaceful nature, Edward conquered Wales and is known as “the hammer of the Scots”. He reigned for 35 years from 1272 – 1307 and was an extremely busy chap. If you’re English, Edward is probably a good egg – but not necessarily loveable. If you’re Scottish or Welsh, Edward is close to being the Devil incarnate. It’s certainly hard to imagine this epitome of medieval kingship going all gooey-eyed and weak at the knees over some woman. But when his wife, Eleanor of Castile, died aged 47 in 1290, Edward made extraordinary, elaborate and expensive, funeral arrangements. They had been married for 36 years (yes, they started young in those days) and had 16 children together. It is said they were rarely apart and that Eleanor even accompanied Edward on his military campaigns – at the time of her death, in Harby, near Lincoln, they were on their way to Scotland with an army. By any standards, but particularly considering this was an arranged marriage, they appear to have been an exceptionally close couple. Eleanor’s viscera (innards) were taken for burial in Lincoln Cathedral; her heart was interred at Black Friar’s, in London; her body was laid to rest in Westminster Abbey – where her effigy can still be seen. The royal funeral procession took 12 days to make the journey from Lincoln to Westminster. It was winter – it must have been cold and depressing journey. At each stage where the cortege rested overnight, Edward ordered that a monumental ‘cross’ should be constructed. And, between 1291 and 1297, they were – twelve of them, at Lincoln, Grantham, Stamford, Geddington, Hardingstone, Stony Stratford, Woburn, Dunstable, St Albans, Waltham (Cross), Cheapside and Charing. Each one included images of the queen, the royal coat of arms, and was a masterpiece of medieval sculpting and masonry work. Yes, London’s Charing Cross was one of them – though the one you see outside the rail and tube station today is a nineteenth century replica and not on the site of the original, which stood near where Trafalgar Square is, at the top of Whitehall (there’s an equestrian statue of Charles I on the spot today). All of this cost a fortune – the cross at Charing alone apparently set the king back £700, a huge amount of money in those days. Mind you, the cash came from Eleanor’s rich estate. Now, while I just don’t get the bit about cutting your wife’s organs out, I’m guessing this had some spiritual significance because the symbolism of everything else suggests Edward loved Eleanor very much indeed. Either that or he was completely nuts. He did not have to go to all this trouble, if you think about it. Or maybe it was guilt – perhaps all Eleanor ever wanted was designer handbags and some nice holidays, and all she got was a ruined figure and endless trips to draughty castles in the company of loads of hairy-arsed soldiers. It would be preferable to think that Edward was grief-stricken and that this was the final act in a medieval romance. Though Edward eventually married again, to Margaret of France, and this too appears to have been a happy union, I get the impression that, for Edward, ‘the first cut was the deepest’. In any event, he made absolutely sure that his Eleanor would never be unknown, or forgotten. She must have been a remarkable woman. 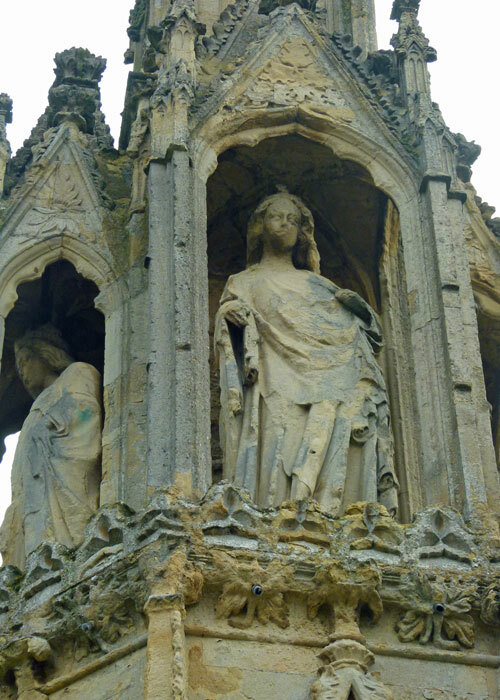 Hardingstone is one of just three surviving original Eleanor crosses, the others being just up the road at Geddington (the best preserved) and at Waltham Cross (the clue’s in the name) in Hertfordshire. 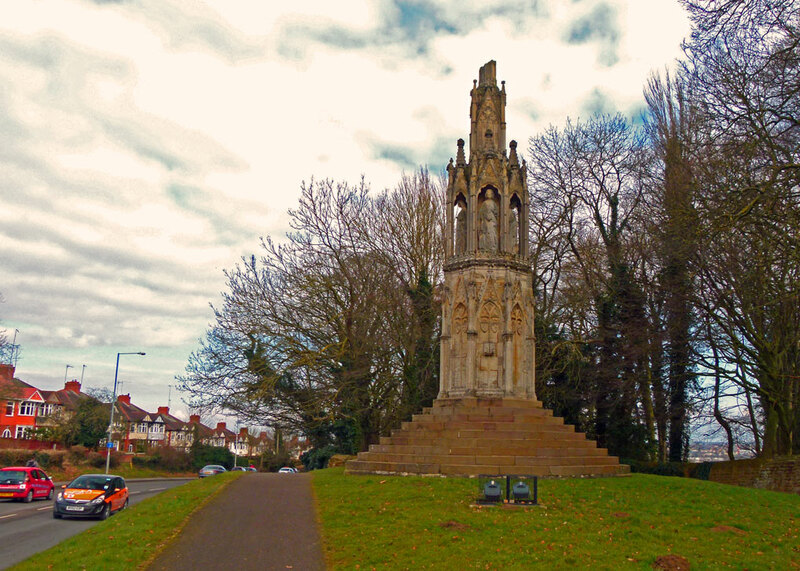 The Eleanor Cross at Hardingstone is on a nondescript, but busy, road close to an equally busy traffic junction not far from the huge Brackmills business estate. With the traffic zooming by, and a residential area opposite, it’s well-nigh impossible to picture what it must have been like more than 700 years’ ago. It would have been a prominent position at the time, on the road south to London at the edge of Delapre Abbey, where the funeral procession had halted. 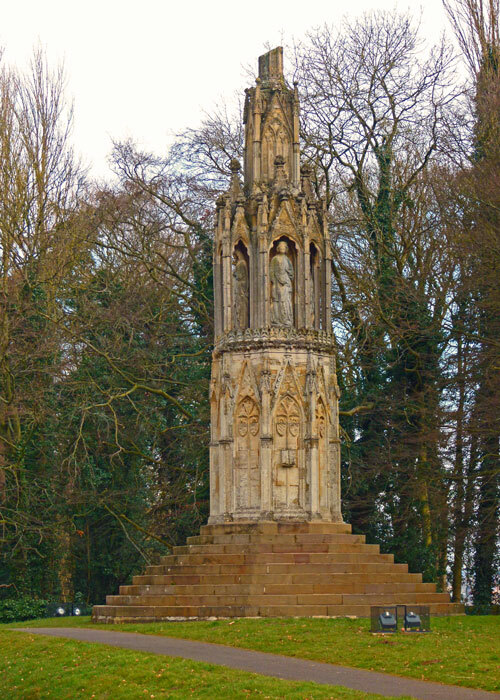 The top ‘cross’ is missing, and has been for centuries, though the monument has been restored. Incidentally, it’s also close to the site of the Battle of Northampton, a short clash in the Wars of the Roses in 1460 which the Yorkists won. The battlefield is now mostly a golf course. You’ll find the other crosses listed in the attraction directory and they will all be featured on A Bit About Britain in due course. If you ever see one, spare a thought for the king who loved his queen and wonder whether anyone’s going to erect a monument to you that people will be looking at 700 years after you’re gone. I’ve always been fascinated by this pair and wish more attention to this era was given and less to the tudors who have been done to death. Bring based in Guildford there are reminders here too of this Queen Eleanor and also he’d equally feisty mother in law Eleanor of Provence. So many Tudors were done to death.. 🙂 Edward and Eleanor ARE fascinating. Thanks for dropping by! When I am next in London and am at Charing Cross, I will think of you and this post! I LOVE to learn things from you! Thanks, Kay – you say the nicest things! What do you mean “close to”? Of course Edward was the devil incarnate! I’m a Stewart after all. As for what he instructed his son to do with his own body….! I guess that’s another story. Wonderful essay; thank you very much! Thanks very much – and thank you for visiting! Thanks for sharing this story. I love a good romance! And thanks for visiting my blog — I’m looking forward to getting better acquainted with yours. Thank you – and thanks for dropping in! i didn’t realize any of the crosses were still around, looking forward to seeing the rest. How interesting was that! Well researched and written. I shrank at the thought of having 16 children! Thank you very muc, and thanks for popping by. Yes, it made my eyes water too! Thanks for this very interesting article Mike! That is a very impressive love story Mike, and a fine piece of history you shared. Fascinating story. I’ve always thought the crosses story of Edward and Eleanor was a wonderful tale. Why would removing the organs be a religious thing? Wouldn’t it be part of embalming the body to keep it in better shape until burial? Anyway, I love the story and your telling of it. I suppose we can eliminate the possibility that Edward considered taxidermy? Hi CM. The practice of separate burial of body parts was not unusual. You’re right, having done a little digging, it seems organ removal was partly to help preserve bodies – eg if a long journey was necessary before burial. Separate burial also enabled prayers for the departed’s soul to be said at different, and sometimes particular, places. Robert the Bruce wanted his heart buried in the Holy Land, for instance. And then there’s Tony Bennett. Who sang, “It had to be you”!? OK, I wish I’d thought of the Tony Bennett quip. I just know you’ll love Sweetheart Abbey. Seems like a lot of tombstones for one body. He must have held her in very high esteem. So how many Eleanors married kings of England? Good question, Marcia. I have no idea – would need to look that up! I got a grin out of “close to being the devil incarnate.” Edward was a very complicated fellow.